CASA of Rock County trains community volunteers to become an advocate for children who, through no fault of their own, have been removed from their home because of abuse or neglect. As a volunteer, you will develop a relationship with your child and make recommendations to the court on their behalf. You will be a consistent adult in their life who will help to ensure that they are safe, their needs are being met, and they are receiving the services they need. Our next training session begins in January 24th, 2019 and will be held every Thursday evening (5:30pm-8:00pm) for eight weeks. CASA volunteer training is a 36 hour commitment. 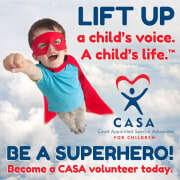 CASA volunteers spends approximately 4 hours a month working on the case and seeing their child.